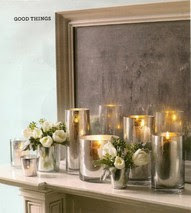 You can never have too many vases or luminaries. Creating your own from materials on hand is both fun and cost effective. You also get to have the pleasure of looking at it every day and knowing that you upcycled something. Of course, accolades from your friends and family don't go astray either. Here are some of my personal favourite ideas collected from Pinterest. Happy creating. I would use these for their sculptural value and forget the greenery which looks forced. Get various shapes and sizes of clear wine bottles. 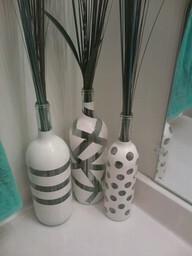 Tape off or use adhesive stickers to create design. Spray paint white and there you have it. So easy and they would look very interesting massed together on a table top or mantle. So, so easy! 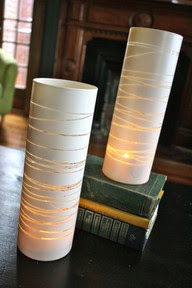 Use elastic bands to stretch around around the clear cylinder vase . 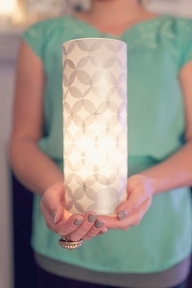 Vary the position of the bands and make sure you have some overlapping, then spray paint. When the candles are lit the design is greatly enhanced. You can now buy battery powered candles which would work best in something this tall. Check out the very detailed instructions for creating this tissue paper collaged vase. You may have seen this idea in Canadian House & Home. Wait for a nice day where you can take your spray paint outside. Clean (remove any labels and adhesive) and dry the bottles and then by pouring a dollop of paint into the bottle, gradually rotate/swirl the paint inside until the paint coats the entire interior. Some may need two coats. Dry on a damp or plastic dropsheet. I think the colour you use will make or break this look. I'm particularly fond of the sea glass green blues. Update: Watch a video how-to by Stephanie White on House and Home's TV. Print your photo on Lazertran paper, making sure the image prints on the chalky eggshell side. Let dry for 30 minutes. Cut the image to size. Soak the printout facedown in a pan of water for about a minute. 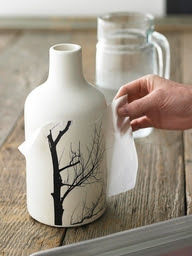 Peel off the backing and place the filmy printout onto a ceramic vase, smoothing out any air bubbles. These look stunning and they are so, so easy to make using Krylon Looking Glass Mirrorlike Spray Paint. 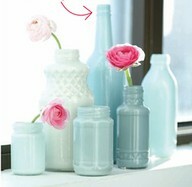 Clean out the vases/votive, spray the interiors lightly with water and then with mirror paint. Turn upside down and let dry overnight. Repeat the process if the first application looks too sheer. If you want to use them for flowers you have to inert a small glass inside to hold the water. Imagine the beautiful table centerpiece these would create using some with flowers and some with candles.